The clinic is a converted house which gives it a more friendly appearance rather than a concrete and steel modern structure. The pets are happier coming to visit us…just ask them! 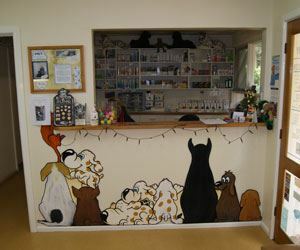 We have some painted Australian animals on the front wall which are a hit with the local Primary school children when they visit. Patient pets wait to be served at reception. Our friendly nurses will greet you here and supply you with all the information you need. We have a “Pet of the Month” photo which creates an interesting conversation point for clients. Another mural that keeps the children amused for ages. 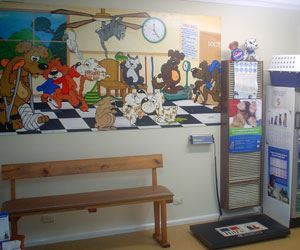 The waiting room has a set of scales so that clients can weigh their pets on arrival. We stock a range of premium foods here and our nurses will advise you on the best product for your much loved pet. Comfortable bench seating maximises our space and a merchandise stand stocking premium products completes the waiting room. Being a converted house allows us to have 2 large consulting rooms. 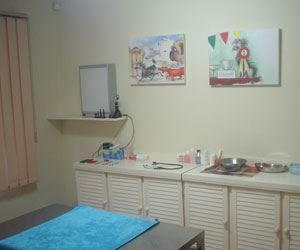 It allows us to carry out examinations on all different sized pets from mice to Great Danes and everything in between. 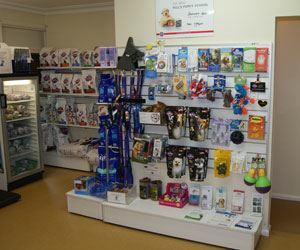 We currently stock a small range of high quality merchandise including leads and collars, harnesses and gentle leaders.We also have some treats and various toys to keep your pets from getting bored. If you are looking for a particular item and we do not have it on display we can almost always source it from our supplier, so don’t be afraid to ask. 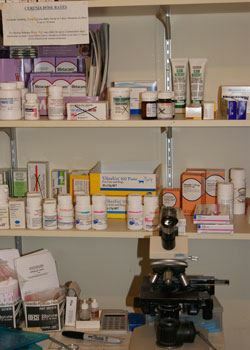 Our range of medications is vast to enable us to examine, diagnose and treat without the need to source medications from other places. On the occasions that we have to use an unusual or “hard to get” drug we will do all the legwork to ensure that you, as our client, are not inconvenienced. 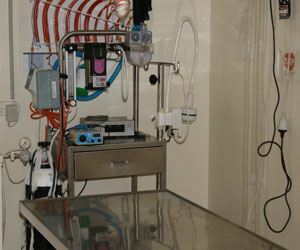 There are 2 surgical suites, both well equipped to provide a safe environment for staff and patients. We have a number of different monitoring systems and a dedicated nurse to oversee all procedures.We operate every weekday and will perform urgent procedures on weekends if required. 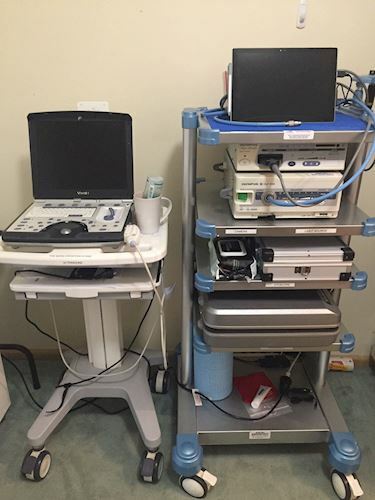 Our latest additions are our portable Utrasound and Endoscopy unit. These additions allow us to diagnose certain conditions that other imaging equipment would not be able to do. 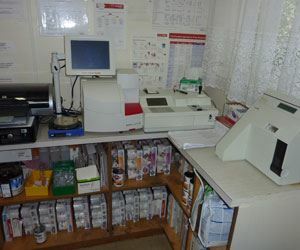 Our extensive in house laboratory enables rapid results with blood testing. In days gone by blood was sent away and the results often took 24 hrs to return. Now we can get results in 15 minutes if urgent. This is a great improvement and certain peace of mind for the owners of a sick pet. 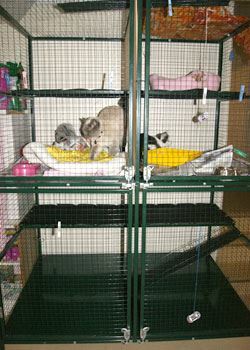 There are 2 large purpose built cat boarding cages which we make available to our clients. 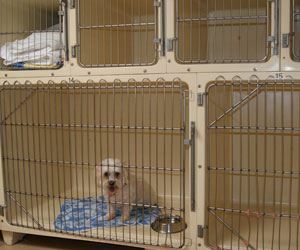 They are suitable for longer stays (up to 2 weeks) or can be divided into 4 smaller cages for shorter stays. 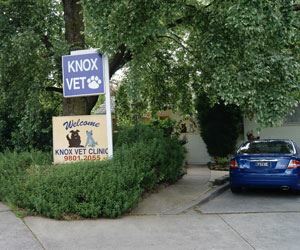 Our clients have peace of mind that their feline friends are being tended to by veterinary nurses each day. Some of our older patients stay on a regular basis as they are on daily medication and their owners wantto ensure they receive it. 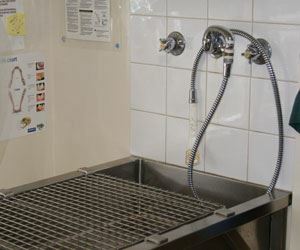 We also have a number of smaller hospital cages that are used for short term boarding over the peak holiday periods. Fibreglass and stainless steel cages with Drybed* bedding means our patients are kept clean and comfortable during their hospital stays. Hospitalised animals are constantly monitored by our veterinary staff and tended to as needed. For ongoing intensive care afterhours we will often transfer patients to the AEC. The wet area is a multipurpose stainless steel workspace for carrying out non-sterile tasks including all dental procedures.